I am a huge fan of Rick and Morty, so I was pretty sure I was going to enjoy this game no matter what. We had a few other fans in our group and a few who had never heard of the show. The pros and cons you’ll find below are our collective opinions of the game. What is Rick and Morty: Total Rickall? 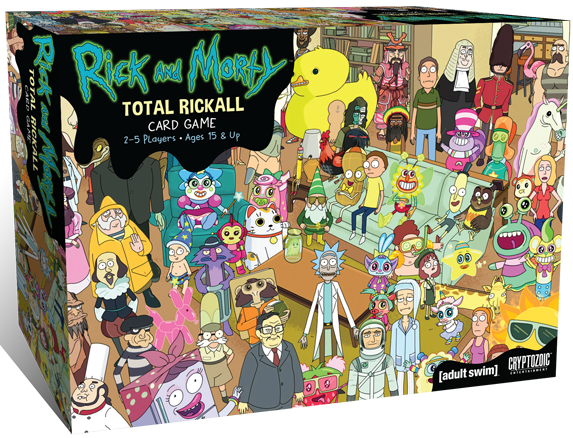 Rick and Morty: Total Rickall is a cooperative card game designed by Matt Hyra and published by Cryptozoic Entertainment. In this game, players are attempting to figure out which characters are space parasites and which ones are real. You don’t know which are which because the aliens have manipulated your memories to make you think you know all of the different characters. Rick and Morty: Total Rickall is extremely easy to teach and learn. Even if you haven’t seen the show and don’t fully understand the theme, you should have no problem understanding how to play this game. The first thing you will do is shuffle the Identity cards and place them face down on the table. You will put a number of these cards down equal to the amount of players times 2. These cards will tell you which Character cards are real and which are parasites. Then you will put the color-coded Character cards on top of the Identity cards. The colors matter when using action cards, which we’ll get to next. Each player will receive three Action cards at the beginning of the game. These cards can be used for a number of different actions, including shooting characters and peeking at their identities. Players will keep their Action cards secret, but they can give other players clues about what they plan on doing. Action cards are placed face down simultaneously, and then revealed simultaneously. Players will then resolve their cards in turn order. To win, you need to decide as a group that only real characters remain on the table (this is done by voting as a group) and being correct. If any parasites are still on the table, then the whole team loses. Those are the rules for the cooperative/standard mode. If you want to see the semi-cooperative/advanced rules, take a look at the official Rick and Morty: Total Rickall rules (PDF). Check out Rick and Morty: Total Rickall at Amazon! Fans of the show should like the fact that the Rick and Morty: Total Rickall episode is captured about as well as the designers could have hoped. They easily could have just made a much simpler game and slapped the theme on top, but they definitely put in the extra effort to make fans happy. We also like the way that they incorporated cooperation in this game. You can’t tell other players what cards you have, but you can help everyone by playing the cards that best help the team. You can also let them know all of the clues that you’ve picked up with your action cards. You won’t run into the “alpha player” problem in this game. Unfortunately, there might not be enough game here for people who aren’t fans of Rick and Morty. It is a unique co-op game, but it is pretty light and relies on people to get into the theme. Non-fans might like it for the first couple of plays, but it could get a bit boring after that. We do recommend that people watch at least one episode of the show before playing to get more out of the experience. Rick and Morty: Total Rickall is a must-have for fans of the popular Adult Swim show. It’s ridiculous and fun, which is exactly how it should be. It’s also a surprisingly unique cooperative game, so it’s one that I will personally be keeping in my collection. 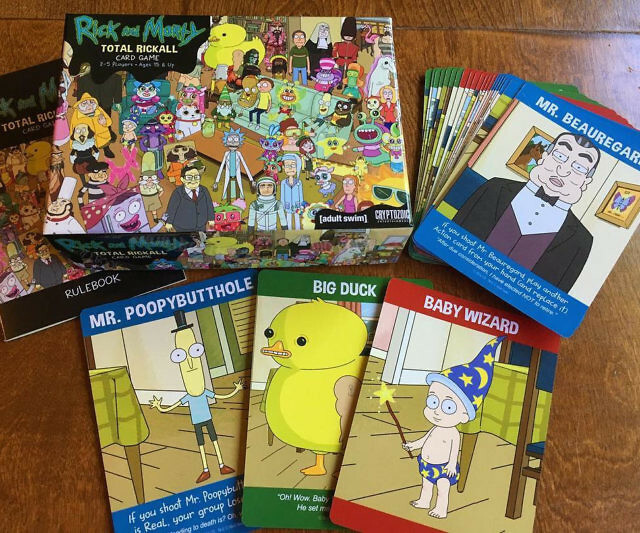 Thanks for taking the time to read our Rick and Morty: Total Rickall Card Game review!